Hello! So this tag was made by Kayleigh and I thought it looked like a really nice tag so I thought I would do it! I never thought I would meet so many amazing people through blogging, it's has made my blogging experience so much better that I've had so many girls to share my excitement when I reach a certain number of followers or I write a blog post I wasn't sure about posting. To have such support is amazing. I am pretty shy in "real life" so people tend not to try and get to know me because it takes a long time for me to open up. Therefore I have a very small number of friends, it's been so crazy to meet people who I now consider friends and people who like me for who I am. It's such a nice feeling for me especially as it has restored my faith in humanity as I have found that there are genuine people out there that care. When I write a new post I am always unsure on the reaction it's going to get, it's such an amazing feeling when you get nice comments and positive feedback from other people. They could comment saying "this post is awful, you are one ugly dawwwg" (LOL) but they are just so lovely and blogging makes me feel like I belong to something finally! Being someone who loves photography and designing and generally anything that involves creativity, blogging is an outlet for all these things. I can do my photography, sit and edit photos and design my layout! Before I got my blog re-designed I would spend everyday making something new for my blog. I was constantly making headers and moving things around! I loved it! As I've said many times, I am very quiet. I usually don't talk much as I don't think anyone wants to hear! It's nice to have a place that's mine, where I can say whatever I want and not feel like I'm being judged for it. It's just so nice to write a post saying how you're feeling and get advice or support from other people or simply write a post of my favourite eye shadow and get feedback on that! Blogging has given me so much confidence, I feel like people do actually (sometimes!) care about what I have to say. I feel so much more comfortable in my own skin, when I put pictures of my self on my blog and get nice comments it makes me feel so much better about myself. Blogging Tip - I get emails from people who ask me how to get a "popular blog" firstly I don't think you should blog purely so you become "popular." I think that talking to other bloggers is vital, it creates a good relationship with other people who do the same thing as you. I also think design is key! Have a nice blog design will make people decide whether they want to follow! Blogger who has inspired me - I think the blogger that inspired me was Estee she has such a lovely personality that really comes across in her blog posts, she also takes great pictures and her reviews are also fab! So that's it! I hope you enjoyed this post and as always I tag you all, so if you want to do this post, do it! Leave a link to the post in the comments so I can be nosey and read it! Really really touching blog post and I couldn't agree more with all the points you've said! Can't imagine not blogging or not being in touch with the people I am in touch with as a result of blogging! 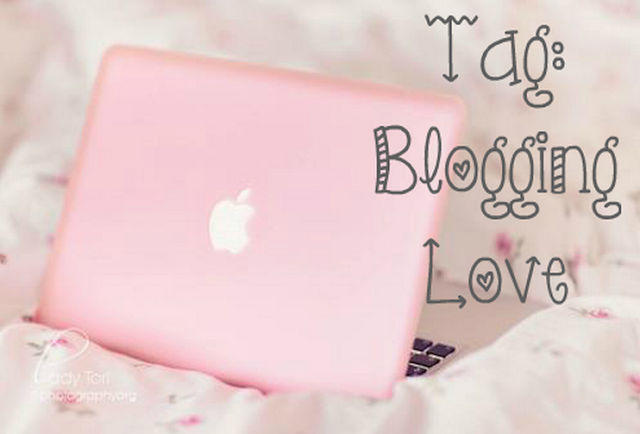 Love your blog, it's so cute!! I'm a new follower. Feel free to follow back!